Thomas Hardy, English novelist and poet, was in born June of 1840. As the son of a local stonemason, he found himself without the family funds to pursue a formal education and left school at the age of sixteen. It was then that he endeavored to apprentice under a local architect; a talent that would see him go on to receive many accolades and eventually take him to London. However, despite enjoying a successful career, he often felt out of place in his new city, largely because of his astute awareness of how socially inferior he perceived himself to be. During his time in London, Hardy developed a keen interest in social reform and the philosophies of John Stuart Mill, Charles Fournier and Auguste Comte. After five years in London, Hardy began to worry about his health and moved back to Dorset, where he would settle in Weymouth and take up writing. A large number of his poems and novels were influenced by Romanticism, and he had a particular fondness for anything akin to William Wordsworth. Despite having penned many novels, Hardy considered himself a poet above all else – even though his first collection of poetry was not published until 1898, several years after he wrote his formative novels Far from the Madding Crowd, The Mayor of Casterbridge, Tess of the d’Urbervilles and Jude the Obscure. The vast majority of his literary works focus on tragedy, telling the tale of disadvantaged characters who battle social circumstances and, of course, love. Hardy fell ill in 1927, and after having dictated his final poem to his wife, succumbed to the effects of pleurisy and died. It was Hardy’s wish that he be buried alongside his first wife, Emma and his family was prepared to see out his wishes. However, his executor insisted that he must be buried in the ‘Poet’s Corner’ in Westminster Abbey. In the virtue of compromise, his heart was buried in the same grave as his first wife, and his cremated ashes were placed in the famous Poet’s Corner. 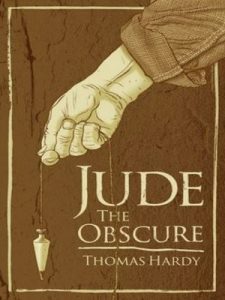 Thomas Hardy’s Jude the Obscure follows the life of Jude Fawley. Jude has lofty dreams of attending the University in Christminster, however, having been orphaned and raised by his working-class aunt, Jude finds himself without the necessary funds to attend such a prestigious institution. Instead, he falls into the career of a stonemason. His scholastic dreams are inspired by the town schoolmaster who had relocated to Christminster when Jude was just a boy. As a young adult, Jude meets and falls in love with a local girl named Arabella. After being tricked into marrying her, he finds himself unable to leave his hometown. However, when the marriage begins to fall apart, Arabella packs up her belongings and moves away to Australia. It was then that Jude promised himself that he would fulfill his dream of moving to Christminster. Unfortunately for Jude, not many share his enthusiasm when he endeavours to enroll at the university. Jude meets Sue Bridehead, his cousin, and promises himself that he will not fall in love with her. In a bid to keep her in Christminster, Jude arranges for Sue to work alongside Phillotson but later regrets his decision when the two become engaged to be married. After the marriage, it does not surprise Jude to learn that Sue is not happy with her new husband. Unable to tolerate her home life, Sue leaves her husband and runs off to live with Jude. Both married to other people, the pair resolve to seek divorces. However, Sue does not wish to remarry. Upon locating Arabella in Australia, so that he can finalize their divorce, she shares with him the news that they have a son together and asks Jude to take the boy to live with him. Together with Sue, he raises the boy and the pair soon welcome two children of their own. Jude becomes ill, and after a long recovery, makes the decision to take his family and return to Christminster. However, because the pair had never wed and bore children outside of the sanctity of marriage, they experienced difficulty securing a place where they could all live together. This caused Jude to have to live in an inn away from Sue and the children. After the sun goes down, Jude’s son, along with Sue, go out to look for better accommodations. Returning unsuccessful, the little boy laments how life would be easier for Jude and Sue if they did not have so many children to care for. The next morning, after Sue and Jude return from eating breakfast in Jude’s room, they are horrified to find that the boy had hanged the other children and himself. Sue believes that this was God’s way of punishing her for carrying on a relationship with Jude. She leaves Jude and returns to her life with Phillotson. Jude finds himself tricked into residing with Arabella once more. A little while later, he dies. Jude Fawley: Jude is a young man, born and raised in the town of Marygreen. He has lofty dreams of pursuing his post-secondary career at the prestigious university in Christminster. However, burdened by fate, Jude was nothing more than an orphan raised by a lower-working class aunt and would never be capable of paying for higher education. Instead, he found employment as a stonemason. Susanna Bridehead: Susanna is a cousin to Jude. She is a peculiar girl, with an eclectic view towards life and education. She marries, and then divorces, the local schoolmaster, Richard Phillotson. However, their marriage does not last. Susanna, or Sue as she often goes by, starts a relationship with Jude and the two have two children together. Arabella Doon: Arabella is the first wife of Jude. She, along with her mother, tricked Jude into marrying her and prevented him from moving to Christminster, originally. However, once her marriage to Jude begins to sour, Arabella moved to Australia. Unbeknownst to Jude, she was pregnant at the time. She later gave birth to a son, who she sent to live with Jude and Sue. Aunt Drusilla: A hard-working and honest woman, Drusilla is Jude’s aunt. After the boy became orphaned, she took him into her home and raised him from childhood. Richard Phillotson: Richard was the schoolmaster in Jude’s hometown. He had moved to Christminster when Jude was just a young boy. It was because of Richard that Jude was so inspired to continue to seek out a higher education. Jude introduces Sue to Richard, in a bid to find her employment and to prevent her from leaving Christminster. However, his plan backfires when the pair become engaged to marry. The marriage does not last, and Sue leaves Richard to move in with Jude. Little Father Time aka. Jude & Arabella’s Son: Little Father Time is the son of Jude and Arabella, he has been raised since infancy by Arabella’s parents in Australia. He is toted to have an old soul; more specifically, despite being young in years, the boy has the mind of an old man. The child is sent to live with Jude and Sue, and feeling that he and his siblings are to blame for the family’s inability to find lodging enough for all of them, the boy slays his siblings and eventually hangs himself.